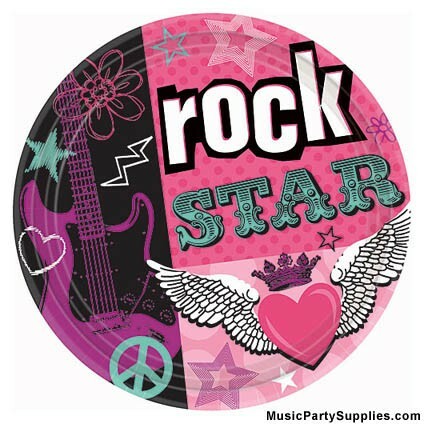 Rocker Girl Plates – 7″ – *CLEARANCE! Serve birthday cake at your music themed party with these cool Rocker Girl Dessert Plates! The design is fun and edgy with artistic design elements centering on a Rock music theme for girls! These party pates will make a memorable addition to your event decorations. Paper Plates. Made in USA. Approx. 7″ (diameter). Set of 8. Also, check out this style in the larger, Rocker Girl 9″ Plates!